I was as thrilled as anyone when Soundgarden announced their reformation and new album. After the successful return of their brothers-in-grunge–Alice In Chains–Chris Cornell and Co. were ready to crank up their unconventionally tuned guitars again and deliver the goods. The resulting effort, King Animal, in my humble opinion is not nearly as interesting as I hoped. 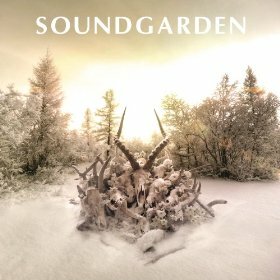 The great thing about Soundgarden is they never put out the same album, keeping things fresh but always with a lingering sense of trippiness (fully embraced on Superunknown.) There is very little of that feel and the majority of the songs just seem uninspired. It has its moments like “Blood On the Valley Floor,” which would have fit in nicely on Badmotorfinger with its dark, sludgy riffing. “By Crooked Steps” is another strong track, as is the hypnotic “Rowing.” However, my favorite track on King Animal is easily “Bones Of Birds,” which has that underlying element of trippiness I mentioned, although this song could have just as easily been on Cornell’s solo debut (the excellent Euphoria Morning). I know Soundgarden does things on their own terms, so I won’t go as far as to say King Animal sounds forced. However, it does come across as safe considering their previous output, but after sixteen years in limbo you can’t blame the guys if they’re just testing the waters a little before jumping back in. Like Cornell says himself in the rocking opening track, “Been Away Too Long,” you can’t go home again–so true. I think King Animal is one of those albums that needs several spins to be appreciated as it does tend to grow on you. I won’t be surprised if I absolutely love it sometime in the near future. All in all, King Animal is a strong enough return for Soundgarden fans old and new to take notice. On a personal note, it’s great to see bassist Ben Shepherd back on the front lines. The band’s secret weapon has definitely been away too long. It’s great to have you back, boys.